It is simple to make homemade hummingbird nectar. With four easy steps you can be feeding hummingbirds an inexpensive, nutritious nectar that will attract them to your yard year after year. Water: Plain tap water is fine, or use bottled water if your tap water is heavily contaminated with strong tastes or odors. Distilled water is ideal if you cannot use tap water, but there is no need for expensive bottled water brands. Sugar: Use only white table sugar, not substitutes or artificial sweeteners. Do not use honey, molasses, agave nectar, or other sugar substitutes, as hummingbirds cannot digest them properly. Similarly, avoid any calorie-free sweeteners, since they do not offer any nutritional value to the birds. Pan: A clean metal (stainless steel) pan is best. Lined pans that may have scratches or cracks could accidentally contaminate nectar, so do not use nonstick pans or other lined or coated pans if they can be avoided. Spoon: Choose a clean, non-contaminated spoon for stirring. Metal, wooden, or nylon spoons can all be used, so long as they are clean. You can also use a blunt butter knife or even a fork instead, as it will be needed only for stirring, not for scooping. The ideal hummingbird nectar recipe is four parts water to one part sugar, and you can make as much or as little nectar as you need with those same proportions. Some birders prefer to make large nectar batches and store extra nectar, while others prefer to make only enough nectar that is needed for each refill. Combine the water and sugar in the pan and stir until completely dissolved. Heating the mixture will help ensure it is fully dissolved. Undissolved sugar can clog feeding ports on hummingbird feeders, but boiling is not necessary unless your water is heavily contaminated. A rolling boil will help remove contaminants from the water if needed. 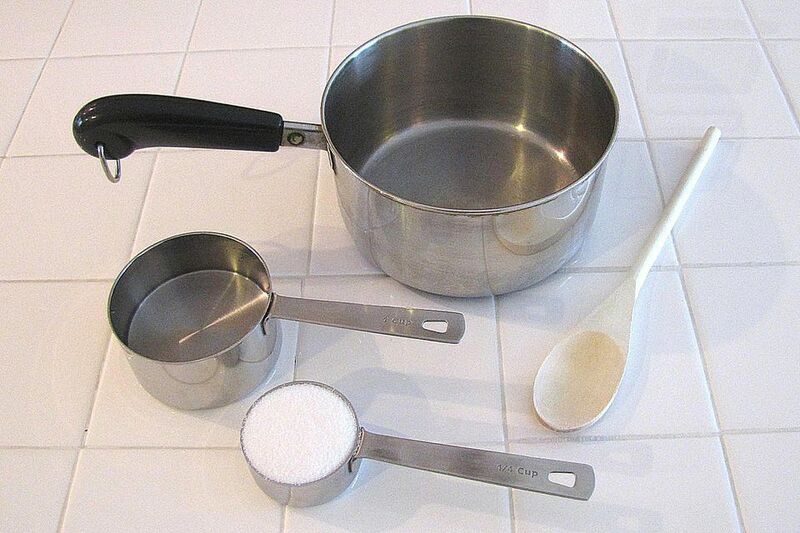 If you do boil the mixture, do not boil it for long or you will change the water-to-sugar ratio. Alternatively, consider boiling the water first, then measuring the proper quantity before adding the sugar to ensure the proper nectar recipe ratio. The sugar will dissolve well in water that is still warm after being boiled, without any additional heating needed. Note: Do not leave the pan unattended on the stove while heating. After the sugar is completely dissolved, remove the pan from the heat and allow the mixture to completely cool. 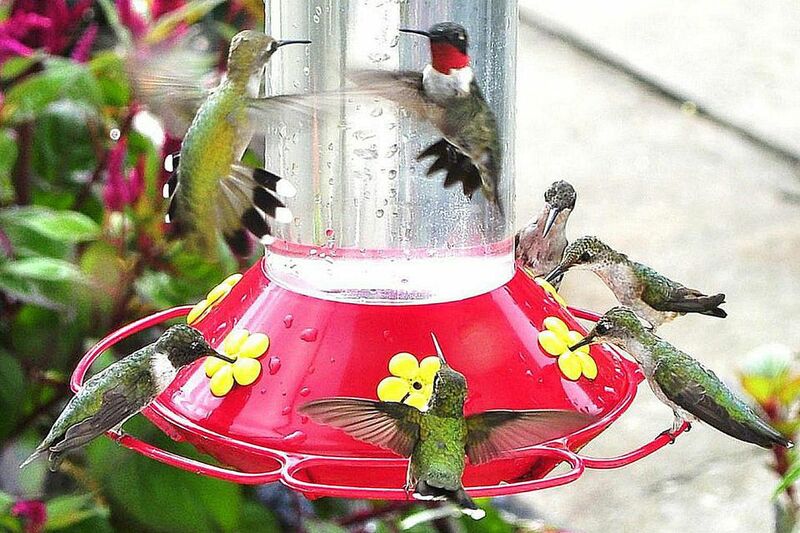 Hot nectar can warp or crack hummingbird feeders. Likewise, a hot pan can burn, stain, or damage counters, so be sure to protect surfaces appropriately with a potholder or trivet. To cool the nectar faster, place it in the refrigerator for approximately 15 minutes, adjusting cooling time for the amount of homemade hummingbird nectar you have made. If you do place hot nectar in the refrigerator, protect the shelf from the hot pan to avoid any damage. A large quantity of nectar may need much more time to cool, or you can divide it into smaller containers for faster cooling. Do not add ice to cool the nectar, as this would change the water-to-sugar ratio and make the nectar less attractive to hummingbirds. Note: While the nectar cools is an excellent time to clean hummingbird feeders. Carefully pour the homemade hummingbird nectar into your favorite hummingbird feeders and hang feeders for the birds to enjoy. Note: Leftover nectar can be stored in the refrigerator for several days until needed. It is not necessary to add red dye to the nectar in order to attract hummingbirds. Red feeder parts, nearby flowers, and garden decorations will attract the birds without any need for extra chemicals in the nectar. Clean hummingbird feeders thoroughly before every refill to avoid mold growth that can be fatal to hummingbirds. Be sure to clean small feeding ports carefully, and wipe down the hanging poles and hooks to remove any feces or sticky residue. Hang feeders in a shaded spot to keep nectar fresh longer, and change nectar every 2-3 days in the hottest weather so it does not spoil. Using smaller hummingbird feeders may be useful in hot summer weather so less nectar is lost to spoilage. In late fall or winter when hummingbirds are still present, it may be necessary to take steps to keep nectar from freezing. This will ensure the birds still have adequate nectar available for feeding even if blooming flowers are less abundant. Still not convinced about making hummingbird food yourself? Check out these top reasons to make your own hummingbird nectar and you'll understand just how important good quality nectar is for hungry hummingbirds!